I was recently invited to give a keynote address at the Human Disease Mapping conference at the Royal College of Surgeons in Ireland that was coordinated by a small group of the college’s PhD students and postdoctoral fellows. I was asked to share my experiences and story of my academic career in a period where global financial and humanitarian crisis is affecting young scientists’ hopes of doing what they love most – science. This was an incredible honor for me (certainly one of the major highlights of my career), and while I may not have given the talk that was expected, I did give the talk that I felt needed to be heard. The address itself was very well received, and because of several requests to make it publicly available, I thought I would share it with you here. Given its length, I have divided the original talk into multiple posts that I will be uploading bi-weekly. I hope you find them useful. It’s past time to speak candidly about the realities of academic training, and share – genuinely – where it falls short regarding career advancement. I hope to provide an altogether different perspective from what you are used to hearing on the real value and promise of your education by sharing some of my own experiences. A lot of what I will say needs to be said, but this will not make it any easier to hear. I don’t want to pretend to tell you how you feel, or what to do – so I will tell you how I feel, and what I have done, in the hope that some of what I say will strike a chord and resonate. For starters, you need to know that 86% of you will not hold tenure-track academic faculty positions. 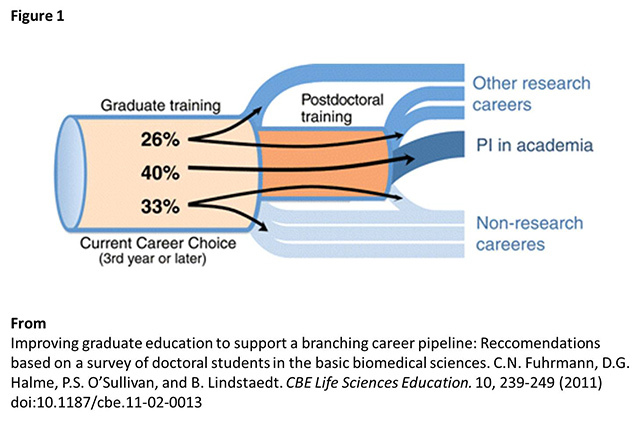 Figure 1 represents what your career pipeline actually looks like – with most of you entering a period of postdoctoral training before pursuing other research-focused career paths, or leaving basic research outright. What is shown here is a career trajectory plot, and it is extremely important that we remove all value judgments from these figures right now. Leaving academic science is not “failure.” In fact, quite the opposite is true, and the stronger case suggests that remaining on the academic trajectory is the mistake. 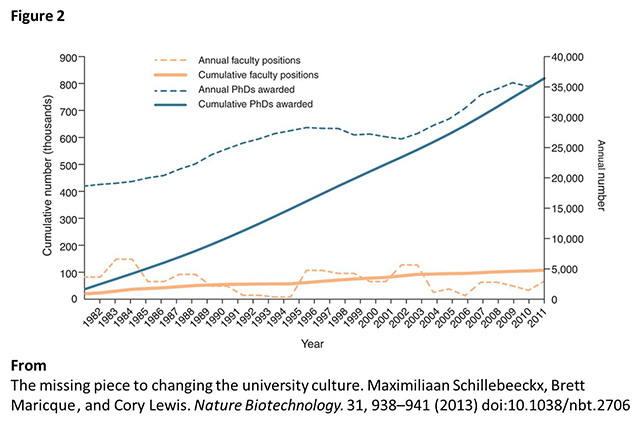 Furthermore, it is important to emphasize that career prospects in academia will not improve any time soon. Figure 2 highlights the reason so few of you will become tenure-track academic faculty despite it being the only career in which most of us will ever receive formal training. 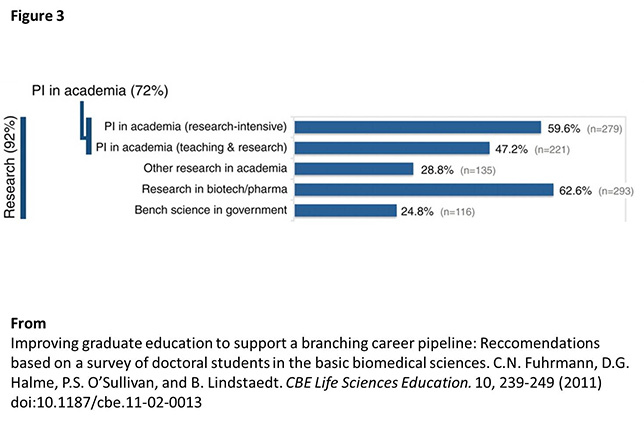 And still: statistically, 72% of you expect to be principal investigators in academia and 92% of you expect to pursue a research-focused career path (Figure 3). I want to be crystal clear here. There is nothing wrong with choosing a career in academia – but choice necessitates options and I don’t believe options truly exist here. From day 1, academic scientists are taught to be academic professors by mentors who have only ever known this one track. Academic departments do not acknowledge that there are insufficient faculty slots to absorb their own trainees, and ironically provide little training support for the major career trajectories pursued by the vast majority of students passing through their halls, despite their primary educational mission. It’s not surprising that 72% of you want to be university professors, but what ensues is the illusion of free and informed choice, with a predictably crushing awakening. Without an offer in-hand from another employer, you are not so much choosing a career in science, as only ever being presented that one option – and your decision to pursue it blindly, however noble, is ill informed, and will end up doing you more harm than good. It’s not a question of if you go on to do more with your degree and skill set, it’s when – and to be perfectly frank, there are better jobs out there. Some of you need to be professors, but the rest of you can be so much more. Let’s be frank then about doctoral pedagogy..which may be captured in this joke. How many doctoral faculty does it take to change a light bulb?